Double Glazed Windows and Doors' focus is to keep the costs down - and this is transferred to the client in form of lower prices. Our staff are constantly maintaining and improving our processes for maximum automation and efficiency to maintain leadership and set high standards in the double glazing industry. In Australia, manufacturing is experiencing difficult times as most of the manufacturing is being outsourced to countries like China, at a cost to quality, which is much more obvious with long life items such as double glazed windows and doors. In order to compete in double glazing on price, we have created a lean business, and due to almost complete automation using high tech machinery, a considerably better class and value double-glazed product. The staff who work on the factory floor are very well trained in double glazed upvc window and door manufacturing procedures which have been developed by our engineer, management accountant and efficiency expert. The method controls bottlenecks in production, utilising mass production principles by combining many separate double glazing orders, recycling internally by creating samples for architects, builders, sales staff and using energy efficiency principles to reduce electricity consumption. Every employee is an expert in their chosen field, and we actively encourage innovation, experimentation as well as participation in training exercises and courses, and as a result our staff derive enjoyment and a sense of achievement, especially out of difficult or challenging projects involving double glazed windows and doors. Although we are lucky to have talented and intelligent people in our team, we strongly believe in results are attained through hard work, high standards and constant improvement. 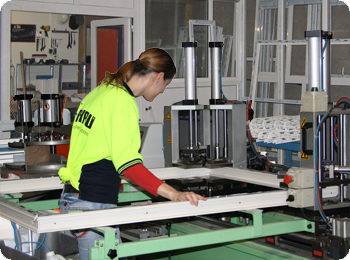 Specialisation and division of labour within the factory as well as on site has provided us with many benefits in double glazed window and door manufacture, such as fewer errors and better quality control, faster completion times as well as an improvement in customer satisfaction because difficult questions are answered in detail giving clients valuable information and useful suggestions that competitors avoid answering. We don't have any errand boys/girls - all our staff are valuable and valued, and perform above expectations. Factory and Installing workforce have undergone a comprehensive induction program in manufacture of upvc double glazed windows and doors as well as training in occupational health and safety as well as specialised training in their chosen role. In total, they compulsorily undergo approximately 6-8months worth of knowledge and hands on training before they can work independently and without supervision. Unfortunately machinery that completes everything is not profitable to sell, and although upvc window and door CNC machinery can cut and weld with high precision, one still is required to purchase several other key step machines. Instead, a lot of space is filled with equipment, which only completes one or two steps in the process. As part of our continuous development and improvement manufacturing philosophy, we have employed specialist help to not only improve our processes but also the machinery itself, to make for faster and more precise results. Instead of purchasing new machinery that was at best mediocre, we have altered our existing machines locally, and with specific custom features, and we are yet to find machines that can do what ours can with the same price tag. Of course, being reliant on machines for the most important steps in production of double glazed windows and doors also carries its own risks - the machinery in the main line can break, in this case we have a contingency plan that includes back up machinery, which is fully operational and can be utilised anytime. We avoid this eventuality by examining and servicing the machines and devices regularly. This guarantees timely fulfilment of any order of double glazed products! We are rapidly developing our facility and transforming it into a facility capable of niche high end complex manufacturing and we are looking into branching out to supply other markets with high quality parts. With every new machinery we purchase, we invest in an engineer to ensure our specific needs are met and equipment improvements are smoothly integrated, as well as providing training on use and limitations. All of this reduces our overheads and having low overheads also benefits our clients because the low cost of maintenance translates into low prices for duble glazed upvc windows and doors. Also, instead of using perpetuating the poverty cycle for thousands of cheap Chinese labourers in an unsafe factory, we use a combination of technologically advanced machinery in a local facility, streamline process improvement and highly skilled and trained specialists who are passionate about their work for a sustainable and environmentally friendly manufacturing process with a social conscience.